Aurthelia Ethel "Tillie" England of Summersville, Kentucky, daughter of the late James Franklin Elmore and Gladys Vaughn Elmore, was born on Friday, July 1, 1938 in Green County and departed this life on Sunday, November 25, 2018 at her home. She was 80 years, 4 months, and 24 days of age. 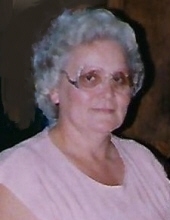 She had made a profession of faith in Christ, was a homemaker, farmer, and former store clerk. Survivors include a son: Timmy Wayne England of Summersville; a daughter: Marilyn Bibb of Summersville; father of their children: Clurell England of Summersville; and a host of other relatives and friends. Ms. England was also preceded in death by a daughter: Tammy Lynn England; and a brother: Elbert Elmore. The funeral services for Tillie England will be conducted at 12 Noon, Central Time, Wednesday, November 28, 2018 at the Cowherd and Parrott Funeral Home with burial to follow in the Aetna Grove Cemetery. Bro. Kelvin Edwards officiating. Visitation is requested after 10 A.M., Central Time, Wednesday at the Cowherd and Parrott Funeral Home until time of the funeral service. Memorials are suggested to the Aetna Grove Cemetery Fund, which can be made at the funeral home. To plant a tree in memory of Tillie England, please visit our Tribute Store. "Email Address" would like to share the life celebration of Tillie England. Click on the "link" to go to share a favorite memory or leave a condolence message for the family.